Secrets of Grindea » Weekly Recap #117: A fat bunch of news! Weekly Recap #117: A fat bunch of news! This week we have so many announcements to make that there’s not even room for game progress to be shown! So let’s dive right into it. First off, after over two years of development we’ve finally opened up an official forum. Yes, it’s true! We’re using the XenForo forum software, and so far everything is working really well! The forum is all-compassing and have sections for both general discussion and feedback from all our followers, beta testers or not! Get over there, register and hang out! Even more exciting – and who thought something could be more exciting than a forum – is that our plans for Early Access have finally taken enough form to be shared! We’ll be taking pre-orders through the Humble Widget, which means everyone who pre-orders the game will get both a DRM-free copy and a Steam key. There won’t be a separate beta tier. Instead we include instant beta access in the base price of $15 (about €11/£9). In traditional crowd funding fashion, we’ll also have several reward tiers if anyone feels more money needs to be thrown around! No, you’re not dreaming. We have a hat as a reward! Our hopes with this funding drive is to get enough income to replace our student loans, letting us entirely focus on the game 100 % without having to (barely) pass courses! There’s also been a huge community demand to open up the gates to the beta. There are over 3500 posts in the beta application thread, and it’s still growing faster than we require new testers! Now, people will be able to try out a demo to get a feel if this is a game for them, and then decide whether they want to support the development to get beta access or not! The exact date for the opening of this pre-order is not set in stone, but it will happen in the next 2-3 weeks! And so the last piece of news is that we’ll invite 40 new testers later this week! There are some adjustments to the story mode we want some fresh insights on before the Early Access goes live. The testers will be, like always, selected at random form the IndieDB thread. You’ll receive a message asking if you’re still interested in beta access, and if you are, we’ll send you a Steam beta key! Hopefully, you’re as excited about all this as we are! 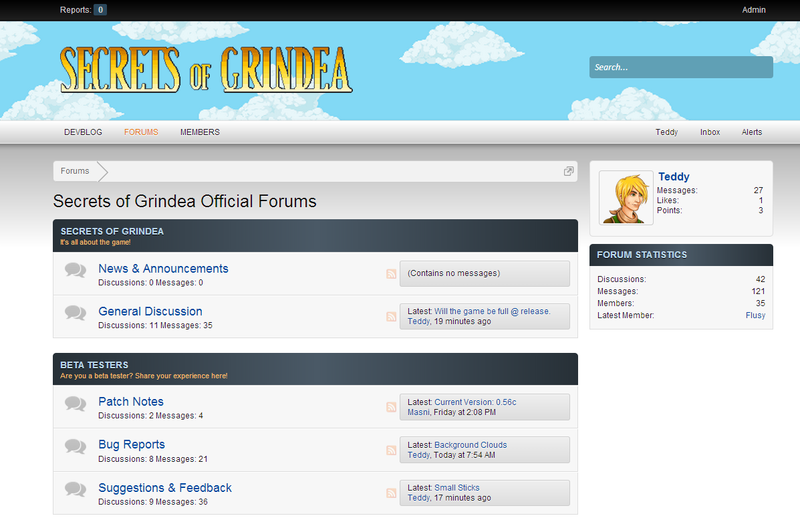 PS: Check out the forum! Posted by Secrets of Grindea at 2014/04/01. Tags: General, Weekly Recap. 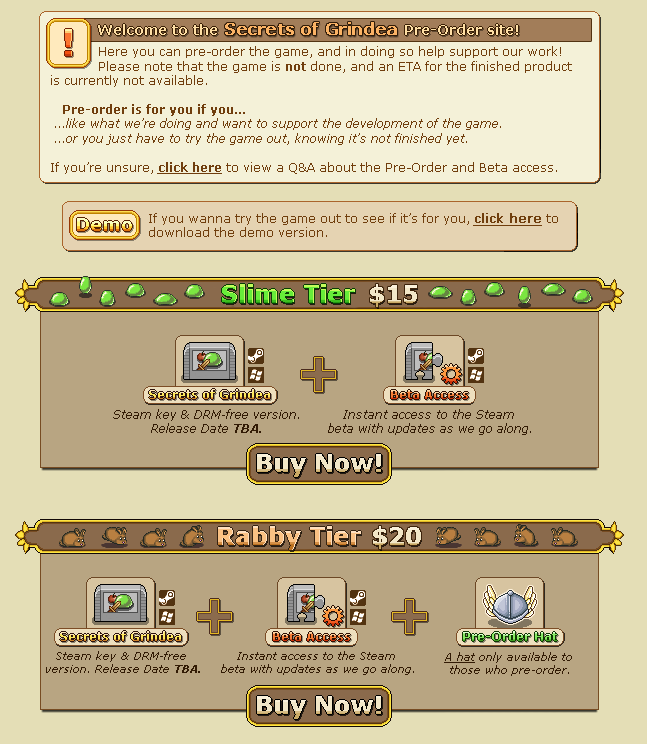 please link the page on here where we can get the preorder/beta access. Calvin i hope it is not and if it so then they have destroyed my HOPE and ill be really Really REALLY sad ='( and what Alex posted we would like the preorder/beta link access please and what Dallaneneta posted YAY!!. Please consider offering a 4-Pack as well. As this is a game I plan to share with all of my friends and family. Crowdfunding is a great idea, guys! Please make it so i can buy a four pack, if not i don’t care i will buy 4 copys for my friends and I! Rabby tier you shall be mine! What a great news ! Now that we know it’s coming soon, the waiting will be even harder than before , have mercy ! i can’t wait for the release!is it present only the concept of rare items to collect or also rare monster to find? Yup, already checked it out! I see, you have an IRC channel as well. Im looking forward to the ‘open’ beta release – Ill be able to play with my friends! 2-3 weeks sounds good, i have to play TESO as long as my free playtime allows to me! I wish you much success with this game!!!!!!! !